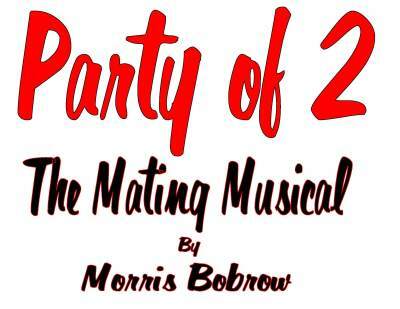 Party of 2 - The Mating Musical is a show-ful of songs which follow the romance of two self-sufficient dynamos, Rebecca and Charlie, from their meeting through their relationship, raising the question - Love Is One Thing, But Can It Survive Living Together? In a Declaration of Independents, the couple navigates romantic relationship stages and eventually has to cope with overexposure. They realize they are, in fact, LATs - lovers best suited to Living Apart Together, a lifestyle more and more popular these days. The show ran for over two years in San Francisco and received 4 San Francisco Bay Area Theater Critics Circle Award nominations, including for Best Entire Production, Best Direction and Best Ensemble, as well as Talkin' Broadway's Top Musical Award. "Party of 2 - The Mating Musical - a musical gem. 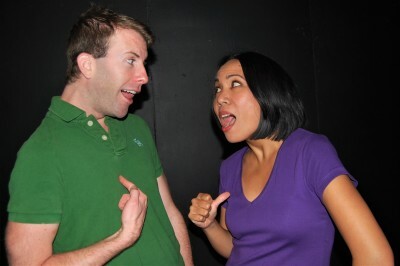 If you believe in love, and well you should, you must not miss this delightful bon-bon, a mini-operetta about the relationship of two independent people who meet, mate and move in together. The observations in this fast-paced and captivating production are profound and all too true. Bobrow's lyrics show an intelligent depth and understanding of human nature, its foibles and its penchant to rip itself into shreds of doubt. We are indeed our own worst enemies, and in a relationship, the discomfort we create for ourselves doubles. Every sequence contains a solid nugget of really lovely truth, like when the two sing, 'If we can do nothing together, then, together there is nothinig we can't do.' So funny, so real, so true. You do not want to miss this wonderful slice of modern reality and discover Bobrow's solution to the souring relationship and the uncomfortable marriage. All the songs are memorable. The pace of the musical is perfect, the singing unforgettable and the script as authentic as it is funny. "The talented and prolific Morris Bobrow has done it again. He has come up with an entertaining 90-minute two-hander musical gem with all the earmarks for a long run. What makes this show a winner is Bobrow's extremely clever lyrics. The names of our potential lovers are simply Charlie, a writer, and Rebecca, a real estate agent, who both profess that they prefer to have a 'romance at a distance.' They meet and the rhyming couplets come fast and furious. There are love songs, ballads, ditties, patter songs and even a tango. This gives you an appreciation of what you're in for with this charming musical."